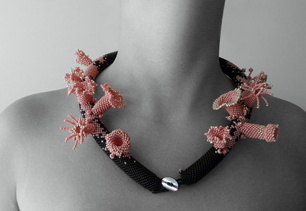 « The works of Czech jewelry artists using glass in contemporary jewelry are presented to the general public very rarely. Therefore the invitation of the Viennese Gallery V&V, which initiated this inspiring project, attracted attention of most of the addressed artists. 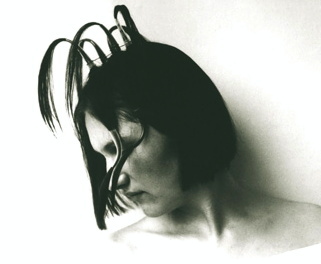 The exhibition features in total 13 artists differing in age, professional experience as well as development of their opinions over the course of their career. It can be said that the exhibited works constitute a comprehensive overview of the most interesting items created in this specific sphere. 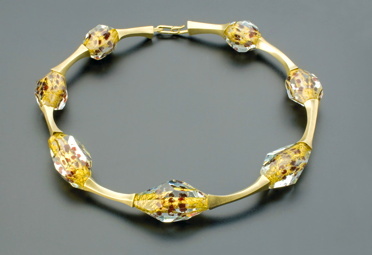 The theme of the exhibition is glass as an original integral part of jewelry. Glass in its variations refers not only to its physical qualities such as fragility or hardness, but primarily its changeable optical and visual beauty, which provides it with a spiritual quality. 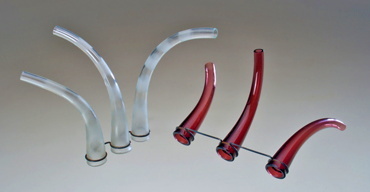 The exhibiting artists present outcomes of their work based on individual approach, representing their personal experience during glass processing. Using unique techniques they record changes of physical qualities and often reach surprising results. The characteristic features of glass are its optical qualities, its exceptional color scheme and the possibility of achieving lustrous shine. 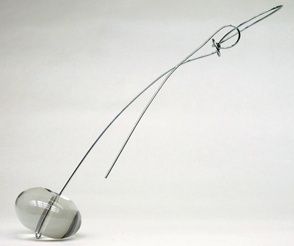 Casting of glass achieves a matted surface,sometimes wrinkled by the artist’s intervention, thereby maintaining the latent mystery of the glass matter. 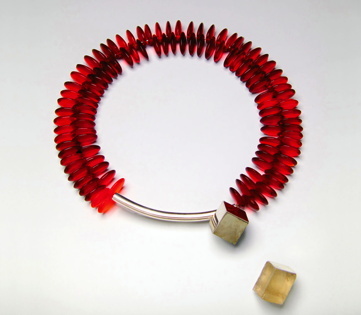 Our admiration for transparent hand-made glass beads in connection with Bohemian garnets may result in an intuitive experience—like our encounter with other works of modern art. The presented jewelry pieces certainly stand out in their original approach and visual language, physically uniting both content and form. 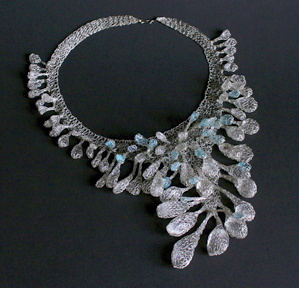 The ultimate purpose of the jewelry piece is its specific presentation when it is eventually worn by a person. The body becomes a moving “carrier” of the work and animates not only the piece of jewelry itself, but also supports and develops the kinesthetic perception of viewers and the person wearing it.A great advantage for all exhibiting artists was the accessibility of using all available technologies of this industry, drawing experience from the rich arts and crafts tradition and the history of glass manufacturing in the Czech regions. Some of the exhibiting artists were influenced not only by artistic processing of glass as we know it from the tradition of preceding generations, but also by the production of Czech artists who attained international esteem with their glass sculptures. 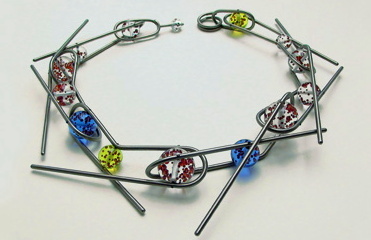 They improve established procedures by experimentation, extending the way glass is used regardless of the context of contemporary art jewelry. This exhibition represents a beneficial step in the field of art which successfully develops the continuity of processing glass, a field often neglected both by curators and the public.